The Model 100 M&P Handcuffs from Smith & Wesson feature an innovative, patented double-locking system that makes them easier to use compared to standard models. The double-lock is finger-activated and does not require keys or other tools. This allows officers to employ both hands when needing to control a suspect. The keyless design also allows easier use with wet or gloved hands. The cuffs feature heat-treated internal lockworks and smooth ratchets to deliver rapid, reliable cuffing. The high-quality carbon steel has a matte black Melonite finish that is highly durable, reduces reflection and resists scratching from daily wear. Great cuffs No fumbling for a tool for double locking. The lever lock is very convenient. Been using them for almost 3 years. Best things I've ever invested in. Never had any issues. 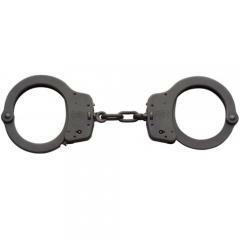 A good back up set of cuffs. Best cuffs. Don't have to take eyes off your surroundings to put double locks on. No tools. Fast. High speed stuff. Super easy to use and the quality you'd expect from smith and wessen. Although it hasn't happened yet I'm concerned I might accidently double lock them if a subject becomes comabative during handcuffing. The lever does need some force to activate and is out of the way during normal handcuffing but it still could become double locked before they ratchet. Criminals don't seem to like them, wonder why. Oh yeah, they work.